That’s a lot of positives for taking a free bus ride—way to go! We offer a FREE emergency ride home. You call, a car comes and takes you where you need to go, 24/7. This also includes a free stop along the way…to pick up a prescription, a child, whatever you need. It’s FREE to participate in all options, including the free bus pass, and you can use more than one option. There’s no cost to you, no applying for reimbursement. You do not have to give up your parking permit to participate. It’s an option for you to save more money, but is not required. If you do, we provide flexible parking on the days you need to drive. Carpoolers park in the same lot (or better) that they already use, and neither carpooler pays for parking (FREE parking!). Don’t have a carpool partner? Try out our carpool matching program. You can check it out without signing up or making a commitment. Cyclists and walkers have FREE access to showers, lockers, and secure indoor bike parking. You don’t have to use TravelSmart every day to participate; use it when it works for you. Did you know that 1,300 faculty, staff, and students have already registered for TravelSmart? They use active transportation to save money, have a positive impact on the environment, and improve the health of our community. Thinking about giving it a try but not sure? 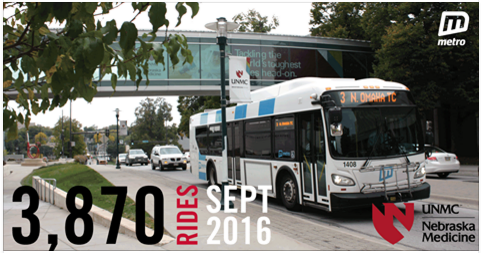 Email travelsmart@unmc.edu for help in planning a bus route, questions about the program, or giving it a “test drive” without signing up. Next Next post: Waste Less. Recycle More. @ Lunch!